The export season of 2017/2018 ended after week 26 with impressive export figures. A staggering 1.153.267 (metric) tons of Holland Onions had crossed our borders by then. An absolute record with an increase of more than 10%. And this growth is in line with the growth in export destinations. This season the Holland Onion travelled to more than 130 countries. This season our export hero set out for entirely new destinations in the Indian Ocean such as Mauritius and Sri Lanka, as well as travelling to already familiar destinations such as Réunion, the Maldives and the Seychelles. Despite being a newcomer Mauritius enters our top 130 at number 47 with almost 3.000 (metric) tons. Sri Lanka is number 64 with almost 1.300 (metric) tons. Indonesia, Malaysia and the Philippines remain major markets and communication continues to be important, in particular with Indonesia which purchased 25.000 (metric) tons this season. 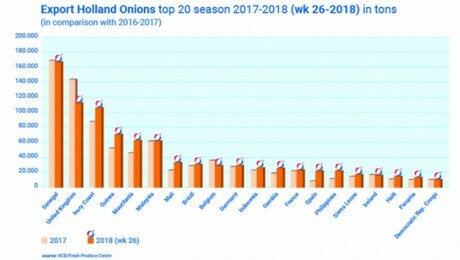 The largest consumers of the past season can once again be found on the African continent with onion-loving countries on the West coast such as Senegal, the Ivory Coast, Mauritania and Guinea all steady in the top 5. We visited some new ports there as well, for example Morocco and Tunisia in the north and Namibia in the south. Unfortunately Libya figures less prominently on the list than a few seasons ago, but besides the already mentioned destinations on the east coast we also find Somalia on the list. The east coast of Africa, which has seen some tumultuous economic developments and where the need for onions increases annually, is attracting a great deal of attention as a new sales market for Dutch onions and offers a huge potential requiring only a few smart logistical connections. What is striking, is that the export to Senegal has remained much the same while the amount of Holland Onions exported to the Ivory Coast has increased with no less than 20%. Another strong grower is Mali with an increase in purchases of more than 40%. These destinations also serve as a transit point, from where the onions are transported deeper into Africa. The Holland onion will have to keep showing its best side over the next couple of years and work hard to establish long-lasting relationships to prevent the market from stagnating due to export vagaries. Closer to home we welcomed Macedonia as a new European destination, while Israel also purchased a nice volume. Turkey came forward as well as a destination for our export hero, when major producer Egypt is quite centrally located for these countries. And Spain tripled its import of the Holland Onion this season. Looking at the United Kingdom we have yet to see signs of the Brexit. The country imported no less than 115.000 (metric) tons of Holland onions. In Central America we see a continuing growth in Guatemala, Panama and El Salvador. Panama even reaches our top 20 this year with a little less than 15.000 (metric) tons. In South America we are also heading for Chile and even Argentina. And of course Brazil was also a welcome destination with 32.000 (metric) tons. Here too we are working hard on exploring new markets such as Costa Rica and Colombia, for which we recently submitted a trade dossier. Furthermore, Brazil is planning a trade mission to our chilly country in November which enables us to deepen our good relationships. New arrivals in the top 20 are Spain and Panama. Countries that dropped from the top 20 are Congo and Jamaica. The top 20 for the export season 2017/2018 is made up of Senegal, Great Britain, the Ivory Coast, Guinea, Mauritania, Malaysia, Mali, Brazil, Belgium, Germany, Indonesia, Gambia, France, Spain, the Philippines, Sierra Leone, Ireland, Haiti, Panama and the Democratic Republic of Congo.